Reverse Afrikansk Fjellgorilla som står nære et vann, med en jungel i bakgrunnen og ordene "Mountain Gorilla 1 oz 999 Fine Silver"
Afrikansk Fjellgorilla som står nære et vann, med en jungel i bakgrunnen og ordene "Mountain Gorilla 1 oz 999 Fine Silver"
1 oz 2015 Mountain Gorilla Sølv Proof Mynt This beautiful silver proof coin is the fourth release in the endangered species series. The Mountain Gorilla has had it's natural habitat in Rwanda, Uganda and the Congo greatly reduced over due to human intrusion on their traditional territory. It is estimated that today there are only 700 Mountain Gorillas left in the wild today, and the species was classified as critically endangered in 2008. The obverse of the coin features the Ian Rank-Broadley effigy of Queen Elizabeth II and the words "Elizabeth II NIUE Two Dollars 2015" and the artist's initials. 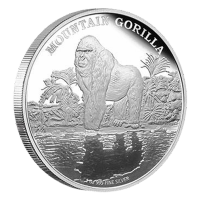 The reverse of the coin depicts a Mountain Gorilla alertly standing by a lake, with a jungle forest, it's preferred habitat, in the background. The Gorilla's image is reflected in the lake, and the mirror-like finish of the coin is truly beautiful. This coin has a strictly limited mintage of 2000, and is a wonderful addition to any wildlife-themed collection.